Check out the Knopf site for a poem each day during National Poetry Month, starting a few hours early with today's offering of "Half Moon, Small Cloud" from John Updike. Sign up on the site to have each day's poem sent to you via e-mail. Check out the blog of Gregory K. Pincus, GottaBook, where there will be a previously unpublished poem aired on each day of April from the top folks in children's poetry. The series starts with one from Jack Prelutsky on April 1. I'm expecting some memorable poems, as well as plenty of giggles and gasps. A little insight into life with a true collector of mysteries: When my husband Dave spotted an early review of CITY OF THE SUN by David Levien, and realized that Michael Connelly had praised it, he quietly picked up a lovely copy for his collection. And the rule is, we leave those lovely copies in fine condition on the shelf -- touch not! So it was only recently that a copy available for me to read came into the shop. I hit the couch with it yesterday afternoon, and by evening it was obvious that I would lose a lot of sleep -- this book demands reading all the way through, no matter how late that makes bedtime. By a quarter of the way through, I was also saying repeatedly to Dave, "This is NOT a first novel. No way. This is expert writing." Which it is. And in fact, although CITY OF THE SUN is a nominee for Strand Magazine's "best first mystery novel," it's Levien's first in that genre, but his third published novel (the others are WORMWOOD; and SWAGBELLY, A NOVEL FOR TODAY'S GENTLEMAN). And he's a well-credentialed screenwriter for such films as "Ocean's 13." The book's been blurbed by Lincoln Child, Harlan Coben, and Robert Crais. Levien's protagonist, a ex-cop (fired for good reason), almost turns down the case that Paul and Carol Gabriel ask him to investigate: the disappearance, 14 months earlier, of their twelve-year-old son Jamie during his early-morning newspaper delivery route. Investigator Frank Behr, "an enigmatic mountain of a man," knows that this is exactly the kind of case he can't afford to take. He needs the money, obviously, but not the heartbreak. What drives the book, and eventually takes it way out of the ordinary for crime fiction, is the poignant relationship developing between investigator and client: Frank and Paul are physically as different as possible, and nothing alike socially, either. But searching for clues on what happened to Jamie forces them into unexpected situations where what's between them becomes at least as important as where they are and who's threatening them next. Pick up a copy now, while there are still some first edition copies available in nice shape. This is a keeper. Please come to help celebrate with these four fine fierce poets! On Sunday, March 29th, at 7:30 pm, prizewinning poets Martha Collins, author of five books of poetry including the recent Blue Front, and Lynne Thompson, author of the poetry collection Beg No Pardon, will read from their work. This program is a Primer for National Poetry Month and sponsored by the Collected Poets Series and Mocha Maya's. Also, to help kick off National Poetry Month, poets Anne Marie Macari with her latest collection, She Heads Into Wilderness will read along with Carey Salerno, author of Shelter on Thursday, April 2nd, at 7:30 pm. Free. Mocha Maya's Coffee House, 47 Bridge Street, Shelburne Falls, MA 01370, 413-625-6292. Wheelchair accessible. See www.collectedpoets.com or www.mochamayas.com for more information. The Collected Poets Series highlights the work of established and emerging poets. Every event showcases the remarkable local poets of Western Massachusetts and the finest regional, national, and international talent. The series is usually held every first Thursday of the month. At her poetry reading today in St. Johnsbury, Vermont, Jody Gladding opened with Mary Ruefle's "After a Rain" -- a lyrical and gentle piece that wraps the act of noticing into the tenderness of daily movement and especially of the natural world. From here, Gladding leapt into one of her most unusual pieces: "Sonogram of Raven Calls," issued entirely in varied sounds that the Vermont mountain ravens offer. Gladding gave no translation, although she was clearly calling from a written script (she has given this poem to other audiences, too). The teens and Vermont poets filling the lounge at St. Johnsbury Academy's Orcutt Library burst into grins and applause. A detailed exploration of the work in her newly released collection, ROOMS AND THEIR AIRS (Milkweed), followed. Gladding's poems play with space on the page, and when she delivers them to an audience, they become dances of breath, voice, and silence. Focusing especially on her Moon series, she introduced students to the writing rules that she crafted for herself for several years -- to write poems that connected with the translated Native American names for the months of the year, each time only writing the designated poem in the month for which its title applied: Crow Moon (March), Travel Moon (August), Sap Moon, and more. Many of the series appear in the limited edition (60 copies) of THE MOON ROSE that Chester Creek Press's Bob Walp crafted with Gladding a few years ago; others have spilled into ROOMS AND THEIR AIRS. Gladding spoke of the way her poems have been moving on the page and then leaving it entirely; she demonstrated the shaping that led away from the left margin, toward the right, and shared poems written on stones, on birch bark, on an egg. "Look Inside and See If You've Won" is formed into a box with peepholes at the ends, and a surprise insect guest inside it. When poems begin to rise for her, Gladding notes them as a sense of motion, so the spacings and form on the pages register that movement, with the pauses as line breaks. She has tried inking them simply onto paper in the midst of the shaping, and now finds, "What they look like [on paper] to me is a transcription of a poem -- like you would have a transcription of a play. It's not 'it.'" A hint for reading the new collection, offered to the students today with several pieces, especially "Vernal Pool": "The 'I' in this is the vernal pool, as much as anything in the poem." We brought home a stack of copies, signed of course; I'll link our listing of them here. And we also have Gladding's first collection, STONE CROP, which won the Yale Younger Poets prize. San Francisco's mayor has declared March 24 a day to honor Lawrence Ferlinghetti, who secured the West Coast focus for the Beat or "wide open" poets through his City Lights bookshop and press and his network of audacious authors. Check out the San Francisco Chronicle's article. Yes, this week is focused on mysteries at Kingdom Books -- but poetry is always at the heart of things too, and we're planning our annual Poetry Party for Saturday April 18 at 11 a.m. Come meet Laura Davies Foley of Cornish, NH, and April Ossmann, now of Vermont but with a long residence at Alice James Books; April will introduce Laura and catch up on connections with poets attending (she's teaching poets quite often!). We've got a full list of guests attending our "limited edition" dinner on March 18 for Brazilian crime writer Leighton Gage, but we may have a few extra copies afterward of both of Gage's books, signed: BLOOD OF THE WICKED and BURIED STRANGERS. E-mail Dave directly at dknel@charter.net if you'd like one or both. Yumm. If you didn't sign up in time, you might want to consider the Boston "suppah" we'll offer when Needham, Mass., author Dave Zeltserman comes to Kingdom Books on Thursday June 25 with his dark and darkly humorous crime novels. More later! The dream of writing doesn't have to include getting fabulously rich -- but it sure would be nice to get published, and sometimes even to get paid something! Pine Manor College presents its 2009 Solstice Summer Writers' Conference with an optional added track: seven sessions on the "how" of the business. Do you long to write more? Does life get in the way? We all know prolific writers who seem to squeeze more time out of the day than the rest of us —writers with families and jobs must learn to see time differently and to claim writing space without guilt. Poet and writer Laura McCullough —a mother of five, teacher at a community college, and director of a program— will explore ways writers can find more writing time and space, and offer tips on how to negotiate work and family roles to better support artistic and creative endeavors. Adding this series to the diverse Solstice list of authors and mentors makes an amazing combination. The conference is June 22-26, at the small campus just outside Boston in Chestnut Hill. This year's special guest is Andre Dubus III author of The Garden of Last Days and of House of Sand and Fog; poets, memoirists, novelists, and skilled writers of short forms like essays and stories gather for the week. Check out the web site, www.pmc.edu/solstice; rolling admissions began in January, and there's financial assistance available. When the National Book Critics Circle announced its annual award in poetry yesterday, two poets shared the honor -- a situation new to the NBCC but resulting from strong feelings for both books among the selection committee members. The co-winners were Juan Felipe Herrera’s Half the World in Light: New and Selected Poems (University of Arizona Press) and August Kleinzahler’s Sleeping It Off in Rapid City (Farrar, Strauss), which the NBCC called "capstone books to important careers—works that were resonant, weighty, and accomplished." Kleinzahler's poetry took root in Fort Lee, NJ, where he grew up (along with his school commute to New York City), but since he's lived in San Francisco for more than 20 years, he gets credit for both coasts. Allen Ginsburg pointed out his work early in his career, but Kleinzahler is relatively young to be associated with the Beats -- he was born in 1949. The New York Times review in 2005 by Timothy Williams is one of the best in painting this poet; the NYTimes also offered an excerpt from Sleeping It Off in Rapid City. And as usual, there's a not-quite-up-to-date summary of Kleinzahler and his books at poets.org. More later on Herrera, when I've caught up a bit. Florida mystery author Barbara Parker died Saturday after a long illness; the Sun-Sentinal obituary shows the way her region embraced her. 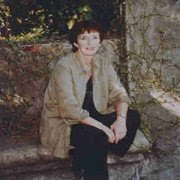 Please do visit www.BarbaraParker.com, where condolences can be left. Dave kept me company this morning for Jodi Picoult's opening reading of her US tour for the new book HANDLE WITH CARE. I phrased that description of Dave's presence carefully, because he was one of only about six men in the crowd of 150 in Norwich, Vermont. That's a bit more balanced than last year's Norwich event for Picoult's CHANGE OF HEART, when Dave was one of only two fellows in the audience ... but still, he says that Picoult is writing a form of women's literature, and he doesn't have the book on his short list for the month (yet). Which to me makes no sense at all! 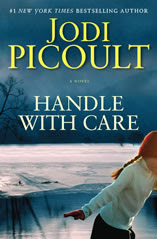 Picoult's novels, loosely grouped on her web site as "novels about family, relationships, and love," are intense and tightly plotted medical/legal thrillers. So what's the difference between her legal fiction and John Grisham's -- percent of pages in the courtroom? Or between her medical twists and those of Michael Crichton? Hers are within the family and the risk is that much higher for her protagonists, I believe. No, if the difference boils down to how carefully Picoult details the dynamics of people who care about each other, then I'm going to compare her work to, say, the crime novels of Andrew Vachss, where Burke's relationships with his friends are his salvation, and his heartaches cost him endlessly. Or to John Lescroart's police/legal twisters, where the conflict between the two sides of justice gives depth to the lifelong friendships that make up the tapestry of his series. Another aspect of Picoult's work to ponder is the dedication of her fans: They don't just purchase her books and share them -- they also agonize with her over how Hollywood changes her story (MY SISTER'S KEEPER comes out as a film this June), exult at reappearances of characters from one book in another, and ponder the ethical dilemmas that Picoult embeds in the thrillers that she writes. Well, I've got to sit down and start reading. I guess I'll let Dave cover the noir material this week, while I burrow into HANDLE WITH CARE. And that's my final bit of evidence for my argument that Picoult's work belongs in the mystery genre: Hey, I'm reading her books, and mysteries and poetry are my top picks, always! PS: I just read this to Dave, and he agreed, after all, that Picoult's books are mysteries -- and more than that. But I think he's still going for the noir. Vermont poet Jody Gladding’s first collection, “Stone Crop,” took the Yale Younger Poets prize and was published in 1993, when she was 38 years old. Even then, she spoke in the tongues of plants and animals, taking meaning from their presence in her paths. Her poem “Fish Song” entwined her own longings with an underwater moment of humor: “the heron is / my patience // my thoughtfulness / the loon // the kingfisher / my nerve // but the osprey / I am wholly // the osprey’s--” (yes, that’s the entire poem). Yet Gladding also aligned grief and loss with the natural world, recalling how the ghostly blessing of a distant deer becomes an unforgettable source of pain when there’s a wounded animal that has to be tracked and shot (“Deer Crossings”). And her vulnerability to these echoes was laid on the pages along with her deep affection for a friend, “Beth,” with whom she explored the Vermont landscape and to whom she sometimes wrote. So when Gladding’s new collection, “Rooms and Their Airs,” opens with “I’ve sold my parents’ house,” a space for expression of the griefs of midlife opens on the page. It’s a space wide enough also for the way body and soul create pathways for birth: Many of the poems in this new collection either paint the birth and nurturing of Gladding’s daughter Aneleisa, or offer conversation to the maturing woman-child in the framework of exploring the prehistoric caves of the Dordogne. Using a sequence titled “February 14—Dordogne,” Gladding offers the stages of maternal and child life together: “1 She slips free,” “2 She lies on my ribs,” “3 She laughs,” “4 She starts to walk,” “5 She wants to sleep in her own bed,” “6 She comes home sick,” “7 She says the snow,” “8 She kneels out.” Aneleisa, and Gladding’s observant parenting, expand and blossom. Tucked among these flowering moments, though, are needles of grief again: I was shocked in the third segment by the phrase “when Beth dies,” which is tucked into a vivid cameo of how life can callously go onward in spite of immense shock and loss. This collection demands comparison with other poets. Gladding’s interactions with the caves of the Dordogne call forth those of Clayton Eshleman: Both poets regularly translate from other languages, and their overlays of meaning on the images within the caves resonate with difference, with gender, with how each one construes family and insight. The forms Gladding chooses – ragged open ones for her “Moon” poems, blocky enjambed ones that pry apart the layers of being among trees, flowers, herbs, birds – take me into re-reading poems by Martha Collins, another poet who translates. And the work of Jane Hirshfield, especially in “After,” has some of the same feel, but with a more direct declaration of the self through “I,” compared to Gladding’s most memorable moments of discovery through her daughter’s emergence. I can’t offer the Moon poems here, because their careful lace of space and location won’t translate readily into this review’s text format, but they are among the innovations of the collection: crocheted from Native American moon names, dark hungers, and feathers of meaning splashed with white glimmering light. It’s significant to me that the cave poems, the moon ones, and the family/friend interactions offer such diverse ways to walk with Gladding within one slim volume of poems. There’s space to read as one who identifies and one who differentiates from the voice on the page, all at once. It’s a delight.